Two computer programs in their native habitat—the memory chips of a digital computer—stalk each other from address to address. Sometimes they go scouting for the enemy; sometimes they lay down a barrage of numeric bombs; sometimes they copy themselves out of danger or stop to repair damage. This is the game I call Core War. It is unlike almost all other computer games in that people do not play at all! The contending programs are written by people, of course, but once a battle is under way the creator of a program can do nothing but watch helplessly as the product of hours spent in design and implementation either lives or dies on the screen. The outcome depends entirely on which program is hit first in a vulnerable area. The term Core War originates in an outmoded memory technology. In the 1950's and 1960's the memory system of a computer was built out of thousands of ferromagnetic cores, or rings, strung on a meshwork of fine wires. Each core could retain the value of one bit, or binary digit, the fundamental unit of information. Nowadays memory elements are fabricated on semiconductor chips, but the active part of the memory system, where a program is kept while it is being executed, is still often referred to as core memory, or simply core. Battle programs in Core War are written in a specialized language I have named Redcode, closely related to the class of programming languages called assembly languages. Most computer programs today are written in a high-level language such as Pascal, Fortran or BASIC; in these languages a single statement can specify an entire sequence of machine instructions. Moreover, the statements are easy for the programmer to read and to understand. For a program to be executed, however, it must first be translated into “machine language,” where each instruction is represented by a long string of binary digits. Writing a program in this form is tedious at best. Assembly languages occupy an intermediate position between high-level languages and machine code. In an assembly-language program each statement generally corresponds to a single instruction and hence to a particular string of binary digits. Rather than writing the binary numbers, however, the programmer represents them by short words or abbreviations called mnemonics (because they are easier to remember than numbers). The translation into machine code is done by a program called an assembler. Comparatively little programming is done in assembly languages because the resulting programs are longer and harder to understand or modify than their high-level counterparts. There are some tasks, however, for which an assembly language is ideal. When a program must occupy as little space as possible or be made to run as fast as possible, it is generally written in assembly language. Furthermore, some things can be done in an assembly language that are all but impossible in a high-level language. For example, an assembly-language program can be made to modify its own instructions or to move itself to a new position in memory. In spite of fairly obvious holes in the story, I believed it, perhaps because I wanted to. It took some time to track down the real events that lay behind this item of folklore. (I shall give an account of them below.) For now it is sufficient to note that my desire to believe rested squarely on the intriguing idea of two programs doing battle in the dark and noiseless corridors of core. Last year I decided that even if the story turned out not to be true, something like it could be made to happen. I set up an initial version of Core War and, assisted by David Jones, a student in my department at the University of Western Ontario, got it working. Since then we have developed the game to a fairly interesting level. Core War has four main components: a memory array of 8,000 addresses, the assembly language Redcode, an executive program called MARS (an acronym for Memory Array Redcode Simulator) and the set of contending battle programs. Two battle programs are entered into the memory array at randomly chosen positions; neither program knows where the other one is. MARS executes the programs in a simple version of time-sharing, a technique for allocating the resources of a computer among numerous users. The two programs take turns: a single instruction of the first program is executed, then a single instruction of the second, and so on. What a battle program does during the execution cycles allotted to it is entirely up to the programmer. The aim, of course, is to destroy the other program by ruining its instructions. A defensive strategy is also possible: a program might undertake to repair any damage it has received or to move out of the way when it comes under attack. The battle ends when MARS comes to an instruction in one of the programs that cannot be executed. The program with the faulty instruction—which presumably is a casualty of war—is declared the loser. Before describing Redcode and introducing some simple battle programs, I should say more about the memory array. Although I have noted that it consists of 8,000 addresses, there is nothing magical about this number; a smaller array would work quite well. The memory array differs from most computer memories in its circular configuration: it is a sequence of addresses numbered from 0 to 7999 but it thereupon rejoins itself, so that address 8000 is equivalent to address 0. MARS always reduces an address greater than 7999 by taking the remainder after division by 8000. Thus if a battle program orders a hit at address 9378, MARS interprets the address as 1378. Redcode is a simplified, special-purpose assembly-style language. It has instructions to move the contents of one address in memory to another address, to alter the contents arithmetically and to transfer control forward or backward within a program. Whereas the output of a real assembler consists of binary codes, the mnemonic form of a Redcode instruction is translated by MARS into a large decimal integer, which is then stored in the memory array; each address in the array can hold one such integer. It is also MARS that interprets the integers as instructions and carries out the indicated operations. A list of the elementary Redcode instructions is given in the table below. With each instruction the programmer is required to supply at least one argument, or value, and most instructions take two arguments. For example, in the instruction JMP -7 the mnemonic JMP (for “jump”) is followed by the single argument -7. 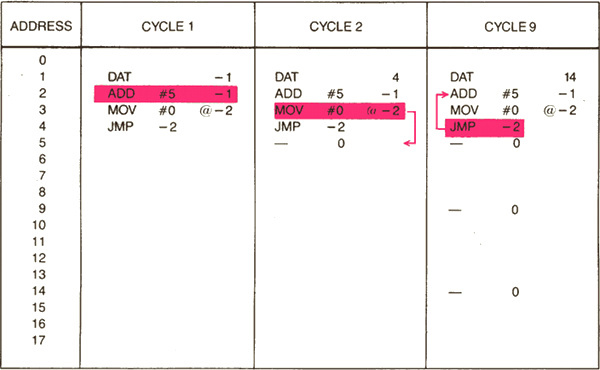 The instruction tells MARS to transfer control to the memory address seven places before the current one, that is, seven places before the JMP -7 instruction itself. If the instruction happened to be at address 3715, execution of the program would jump back to address 3708. 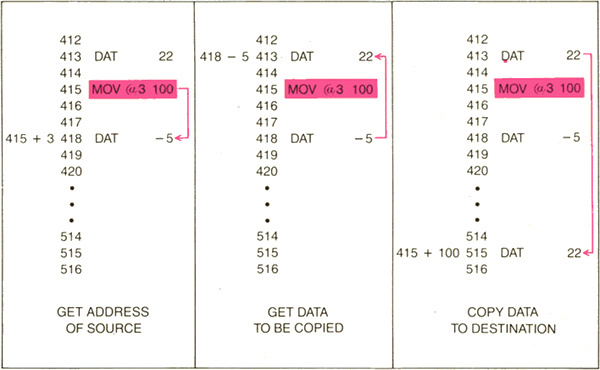 Move MOV 1 A B Move contents of address A to address B. Add ADD 2 A B Add contents of address A to address B.
Subtract SUB 3 A B Subtract contents of address A from address B. Jump JMP 4 A Transfer control to address A.
if contents of B are zero. if contents of B are greater than zero. if contents of address B are then zero. B is the data value. This method of calculating a position in memory is called relative addressing, and it is the only method employed in Redcode. There is no way for a battle program to know its own absolute position in the memory array. The instruction MOV 3 100 tells MARS to go forward three addresses, copy what it finds there and deliver it 100 addresses beyond the MOV instruction, overwriting whatever was there. The arguments in this instruction are given in “direct” mode, meaning they are to be interpreted as addresses to be acted on directly. Two other modes are allowed. Preceding an argument with an @ sign makes it “indirect.” In the instruction MOV @3 100 the integer to be delivered to relative address 100 is not the one found at relative address 3 but rather the one found at the address specified by the contents of relative address 3. (The illustration below gives more detail on the process of indirect addressing.) A # sign makes an argument “immediate,” so that it is treated not as an address but as an integer. 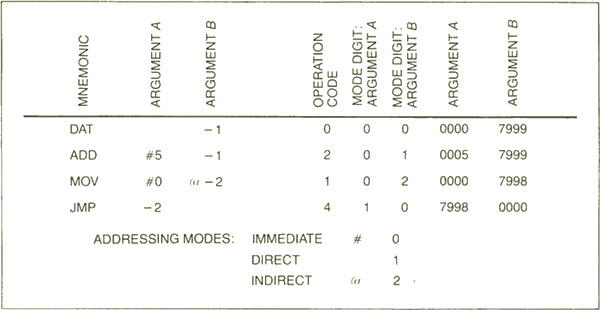 The instruction MOV #3 100 causes the integer 3 to be moved to relative address 100. Most of the other instructions need no further explanation, but the data statement (DAT) requires some comment. It can serve as a work space to hold information a program may need to refer to. Strictly speaking, however, it is not an instruction; indeed, any memory location with a zero in its first decimal position can be regarded as a DAT statement and as such is not executable. If MARS should be asked to execute such an “instruction,” it will not be able to and will declare that program the loser. The decimal integer that encodes a Redcode instruction has several fields, or functional areas [see illustration below]. The first digit represents the mnemonic, and two more digits identify the addressing mode (direct, indirect or immediate). In addition four digits are set aside for each argument. Negative arguments are stored in complement form: -1 would be represented as 7999, since in the circular memory array adding 7999 has the same effect as subtacting 1. The instructions making up a simple battle program called Dwarf are listed in the illustration below. Dwarf is a very stupid but very dangerous program that works its way through the memory array bombarding every fifth address with a zero. Zero is the integer signifying a nonexecutable data statement, and so a zero dropped into an enemy program can bring it to a halt. Assume that Dwarf occupies absolute addresses 1 through 4. Address 1 initially contains DAT -1, but execution begins with the next instruction, ADD #5 -1. The effect of the instruction is to add 5 to the contents of the preceding address, namely the DAT -1 statement, thereby transforming it into DAT 4. Next Dwarf executes the instruction at absolute address 3, MOV #0 @-2. Here the integer to be moved is 0, specified as an immediate value. The target address is calculated indirectly in the following way. First MARS counts back two addresses from address 3, arriving at address 1. It then examines the data value there, namely 4, and interprets it as an address relative to the current position; in other words, it counts four places forward from address 1 and hence deposits a 0 at address 5. 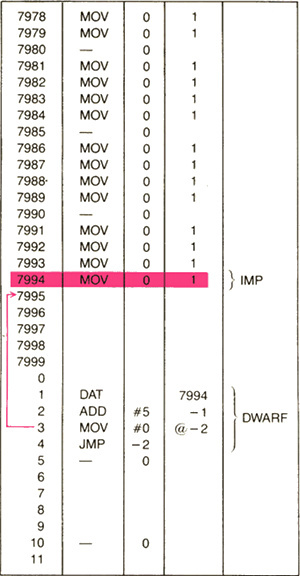 The final instruction in Dwarf, JMP -2, creates an endless loop. It directs execution back to absolute address 2, which again increments the DAT statement by 5, making its new value DAT 9. In the next execution cycle a 0 is therefore delivered to absolute address 10. Subsequent 0 bombs will fall on addresses 15, 20, 25 and so on. The program itself is immobile but its artillery threatens the entire array. Eventually Dwarf works its way around to addresses 7990, 7995 and then 8000. As far as MARS is concerned, 8000 is equal to 0, and so Dwarf has narrowly avoided committing suicide. Its next missile again lands on address 5. It is sobering to realize that no stationary battle program that has more than four instructions can avoid taking a hit from Dwarf. The opposing program has only three options: to move about and thereby elude the bombardment, to absorb hits and repair the damage or to get Dwarf first. To succeed through the last strategy the program may have to be lucky: it can have no idea where Dwarf is in the memory array, and on the average it has about 1,600 execution cycles before a hit is received. If the second program is also a Dwarf, each program wins 30 percent of the time; in 40 percent of the contests neither program scores a fatal hit. Imp is the simplest example of a Redcode program that is able to relocate itself in the memory array. It copies the contents of relative address 0 (namely MOV 0 1) to relative address 1, the next address. As the program is executed it moves through the array at a speed of one address per cycle, leaving behind a trail of MOV 0 1 instructions. What happens if we pit Imp against Dwarf? The barrage of zeros laid down by Dwarf moves through the memory array faster than Imp moves, but it does not necessarily follow that Dwarf has the advantage. The question is: Will Dwarf hit Imp even if the barrage does catch up? Imp v. Dwarf: Who wins? Both Imp and Dwarf represent a class of programs that can be characterized as small and aggressive but not intelligent. At the next level are programs that are larger and somewhat less aggressive but smart enough to deal with programs in the lower class. The smarter programs have the ability to dodge an attack by copying themselves out of trouble. Each such program includes a segment of code somewhat like the one named Gemini, shown in the illustration below. Gemini is not intended to be a complete battle program. Its only function is to make a copy of itself 100 addresses beyond its present position and then transfer execution to the new copy. The Gemini program has three main parts. Two data statements at the beginning serve as pointers: they indicate the next instruction to be copied and its destination. A loop in the middle of the program does the actual copying, moving each instruction in turn to an address 100 places beyond its current position. On each transit through the loop both pointers are incremented by 1, thereby designating a new source and destination address. A compare instruction (CMP) within the loop tests the value of the first data statement; when it has been incremented nine times, the entire program has been copied, and so an exit from the loop is taken. One final adjustment remains to be made. The destination address is the second statement in the program and it has an initial value of DAT 99; by the time it is copied, however, it has already been incremented once, so that in the new version of the program it reads DAT 100. This transcription error is corrected (by the instruction MOV #99 93) and then execution is transferred to the new copy. By modifying Gemini it is possible to create an entire class of battle programs. One of these, Juggernaut, copies itself 10 locations ahead instead of 100. Like Imp, it tries to roll through all its opposition. It wins far more often than Imp, however, and leads to fewer draws, because an overwritten program is less likely to be able to execute fragments of Juggernaut's code. Bigfoot, another program employing the Gemini mechanism, makes the interval between copies a large prime number. Bigfoot is hard to catch and has the same devastating effect on enemy code as Juggernaut does. Neither Bigfoot nor Juggernaut is very intelligent. So far we have written only two battle programs that qualify for the second level of sophistication. They are too long to reproduce here. One of them, which we call Raidar, maintains two “pickets” surrounding the program itself [see illustration below]. Each picket consists of 100 consecutive addresses filled with 1's and is separated from the program by a buffer zone of 100 empty addresses. Raidar divides its time between systematically attacking distant areas of the memory array and checking its picket addresses. If one of the pickets is found to be altered, Raidar interprets the change as evidence of an attack by Dwarf, Imp or some other unintelligent program. Raidar than copies itself to the other side of the damaged picket, restores it, constructs a new picket on its unprotected side and resumes normal operation. In addition to copying itself a battle program can be given the ability to repair itself. Jones has written a self-repairing program that can survive some attacks, although not all of them. Called Scanner, it maintains two copies of itself but ordinarily executes only one of them. The copy that is currently running periodically scans the other copy to see if any of its instructions have been altered by an attack. Changes are detected by comparing the two copies, always assuming that the executing copy is correct. If any bad instructions are found, they are replaced and control is transferred to the other copy, which then begins to scan the first one. So far Scanner remains a purely defensive program. It is able to survive attacks by Dwarf, Imp, Juggernaut and similar slow-moving aggressors—at least if the attack comes from the right direction. Jones is currently working on a self-repair program that keeps three copies of itself. I am curious to see whether readers can design other kinds of self-repairing programs. For example, one might think about maintaing two or more copies of a program even though only one copy is ever executed. The program might include a repair section that would refer to an extra copy when restoring damaged instructions. The repair section could even repair itself, but it might still be vulnerable to damage at some positions. One measure of vulnerability assumes that a single instruction has been hit; on the average, how many such instruction, if they are hit, ultimately cause the program to die? By this measure, what is the least vulnerable self-repairing program that can be written? Only if reasonably robust programs can be developed will Core War reach the level of an exciting game, where the emphasis is shifted from defense to offense. Battle programs will then have to seek out and identify enemy code and mount an intensive attack wherever it is found. I may have given the impression that Redcode and the entire MARS system are fixed. They are not. In spare moments we have been experimenting with new ideas and are certainly open to suggestions. Indeed, we have been experimenting so much with new programs and new features that some battles remain to be fought in our own system. One idea we have been playing with is to include an extra instruction that would make self-repair or self-protection a little easier. The instruction PCT A would protect the instruction at address A from alteration until it is next executed. How much could the vulnerability of a program be reduced by exploiting an instruction of this kind? The two battle programs are loaded into the memory array at random positions but initally are no closer than 1,000 addresses. MARS alternates in executing one instruction from each program until it reaches an instruction that cannot be executed. The program with the erroneous instruction loses. Programs can be attacked with any available weapon. A “bomb” can be a 0 or any other integer, including a valid Redcode instruction. A time limit is put on each contest, determined by the speed of the computer. If the limit is reached and both programs are still running, the contest is a draw. In Darwin each player submits a number of assembly-language programs called organisms, which inhabit core memory along with the organisms of other players. The organisms created by one player (and thus belonging to the same “species”) attempt to kill those of other species and occupy their space. The winner of the game is the player whose organisms are most abundant when time is called. McIlroy invented an unkillable organism, although it won only “a few games.” It was immortal but apparently not very aggressive. Worm was an experimental program designed to make the fullest use possible of minicomputers linked in a network at Xerox. Worm was loaded into quiescent machines by a supervisory program. Its purpose was to take control of the machine and, in coordination with Worms inhabiting other quiescent machines, run large applications programs in the resulting multiprocessor system. Worm was designed so that anyone who wanted to use one of the occupied machines could readily reclaim it without interfering with the larger job. One can see elements of both Darwin and Worm in the story of Creeper and Reaper. In Core War, Reaper has become reality. Computer Recreations: “Darwin.” Aleph Null in Software: Practice & Experience, Vol. 2, No. 1, pages 93–96; January–March, 1972. 68000 Assembly Language Programming. Gerry Kane and Doug Hawkins Legenthal. Osborne-McGraw-Hill, 1981.